New Museum is proud to partner with Visual AIDS on World AIDS Day for a theater presentation of ALTERNATE ENDINGS, ACTIVIST RISINGS, Visual AIDS’s twenty-ninth annual Day With(out) Art project. Commissioned by Visual AIDS, ALTERNATE ENDINGS, ACTIVIST RISINGS highlights the impact of art in AIDS activism and advocacy today through compelling short videos from six inspiring community organizations and collectives: ACT UP NY, Positive Women’s Network, Sero Project, The SPOT, Tacoma Action Collective, and VOCAL NY. 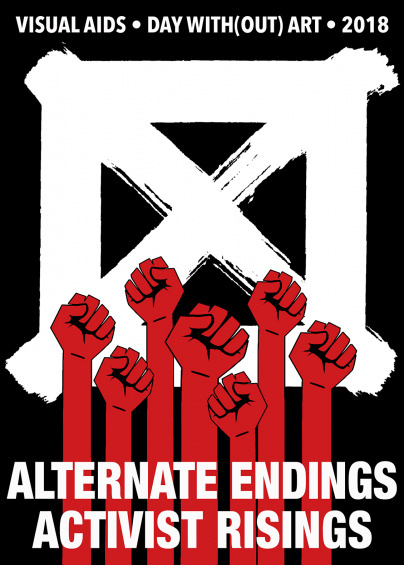 ALTERNATE ENDINGS, ACTIVIST RISINGS seeks to reflect the persisting urgency of the HIV/AIDS epidemic today by pointing to pressing and intersecting political concerns, including HIV criminalization, Big Pharma, homelessness, and the disproportionate effects of HIV on marginalized communities. At a moment of growing interest in the histories of AIDS activism, ALTERNATE ENDINGS, ACTIVIST RISINGS foregrounds contemporary engagements between activists, artists, and cultural workers on the front lines. ALTERNATE ENDINGS, ACTIVIST RISINGS will play in the New Museum Theater all day. Screenings are free with Museum admission and will take place on the hour beginning at 11 a.m., with the last screening at 5 p.m.
AIDS Coalition to Unleash Power (ACT UP) NY (New York, NY) is a diverse, nonpartisan group of individuals, united in anger and committed to direct action to end the AIDS crisis. ACT UP was formed in 1987 in response to social neglect, government negligence, and the complacency of the medical establishment during the 1980s. Soon it found itself needing to fight corporate greed, a lack of solidarity, and various forms of stigma and discrimination at home and abroad. ACT UP fights for: sustained investment in research for new medicines and treatments for HIV/AIDS and related co-infections; equitable access to prevention and care for HIV/AIDS and healthcare, in general; tackling the structural drivers of the HIV/AIDS epidemic, such as stigma, discrimination and poverty. Positive Women’s Network – USA (PWN) is a national membership body of women living with HIV and allies that exists to strengthen the strategic power of all women living with HIV in the United States. Founded in 2008 by twenty-eight diverse women leaders living with HIV, PWN-USA develops a leadership pipeline and policy agenda that applies a gendered lens to the domestic HIV epidemic grounded in social justice and human rights. Every day, PWN-USA inspires, informs and mobilizes women living with HIV to advocate for changes that improve lives and uphold rights. Sero Project is a national network of people with HIV and allies fighting for freedom from stigma and injustice. Sero is particularly focused on ending inappropriate criminal prosecutions of people with HIV, including for non-disclosure of their HIV status, potential or perceived HIV exposure or HIV transmission. Sero coproduces the biennial HIV is Not a Crime conference, which provides advocates from across the country with training on strategies and best practices for repealing laws that criminalize people living with HIV. Safe Place Over Time (The SPOT) (Jackson, MS) is dedicated to providing services and opportunities for wellness, empowerment, and leadership to young men in Jackson, Mississippi. The program aims to improve health outcomes and reduce new cases of HIV among African Americans who are disproportionately affected by the epidemic. The SPOT strives to be a safe place for young men to openly discuss issues and challenges, and to work to improve their quality of life and to promote the concept of self-worth. The SPOT is housed in the Jackson Medical Mall, a former shopping mall that now provides healthcare for the underserved and promotes economic and community development. Tacoma Action Collective (Tacoma, WA) is a partnership of Black community organizers working in grassroots action and education in Washington State. TAC works to eliminate systemic oppression and structural violence while empowering the people to build autonomous communities rooted in equity and justice. In 2015, the collective staged a die-in at the Tacoma Art Museum in response to the white-washing of the exhibition “Art, AIDS, America”. VOCAL (Voices Of Community Activists & Leaders) (New York, NY) is a statewide grassroots membership organization that builds power among low-income people affected by HIV/AIDS, hepatitis C, the drug war, homelessness, and mass incarceration in order to create healthy and just communities. VOCAL accomplishes this through community organizing, leadership development, public education, direct services, participatory research and direct action. Education and Public Engagement programs at the New Museum are made possible, in part, by the New York City Department of Cultural Affairs and the New York State Council on the Arts.